In my last two posts I addressed need for educators to think more seriously about the ways that our students use personal technology in the classroom. The real issue, as I tried to make clear, is that the devices so many students use to read and take notes also give them access to the internet, and thus endless distraction. What should we do? How can schools, especially Catholic schools, maintain the integrity of the classroom, while acknowledging the great tool that technology can be? What we need is a larger sense of purpose, a framework that guides how we implement technology in our classes so that it serves as a tool that helps us educate, rather than a master that dictates how we educate. In this realm of guiding principles our schools have utterly dropped the ball. We are quick to institute “technology policies,” such as saying that we will allow technology x but not y, or uttering vapid statements about creating “forward-thinking” students who are “equipped for tomorrow’s world.” Yet we seem reluctant to go beyond these statements to explain why we allow x but not y, or what “forward-thinking” actually means. Catholic schools, however, are in a unique position to offer more than empty rhetoric and actually provide a framework for the use of technology that orients it toward the goals of education. And such a framework shouldn’t just pertain to recent innovations like smartphones and laptops, but should be able to guide our schools through all kinds of territory, whether the technology in question refers to Power Point presentations or Google Glass or whatever the future may hold. Really, the issue boils down to one question: What is the role of a Catholic teacher in today's world, where access to information is unlimited? To answer this, we should turn to the sacraments to guide our conception of what a classroom should be. This probably sounds snarky and pious, so let me explain. I don’t mean that each classroom should be decked out with incense and icons and Salve Regina playing on Spotify. Holy water fonts do not need to replace Purel dispensers. By “sacramental” I’m referring to the Catholic understanding that the spiritual world manifests itself through the physical world, not in spite of it. In each of the seven sacraments grace is channeled through the physical actions of another person, usually, but not always, a priest, who is physically present with the recipient of that sacrament. You can’t be confirmed over the phone, or confess your sins via Skype. A priest must be there to administer the sacrament, to anoint with oil, lay on hands, or absolve with the sign of the cross. In short, sacraments communicate a theology of presence, the epitome of which is found in the Eucharist, in which Catholics believe Christ is physically present. What does this all have to do with iPads? For one, it should remind us that in teaching, as in all things, it’s important to demand that our students are present with us, and that we, in turn, are present with them. I’m using “present” here in the largest sense, to indicate that state when mind and body are united in focus on what is here and now. As those know who have ever attempted to teach a large group of students, cultivating this kind of attention is a struggle, and a teacher whose goal is to demand it 100% of the time is on the fast-track to burnout. Still, as human beings, it’s what we aim for, and what we hope serves as the bedrock for all that happens in our classrooms. As we all know in this age of screens, it’s precisely this kind of presence with others that our devices get in the way of. No one wants to have a conversation with someone whose mind is elsewhere, who is watching TV or scrolling on a phone. For the one fixed on it, the screen is more interesting than whatever else is going on in the room, especially if that room is a classroom. The theology of presence found in the sacraments has its roots in Christ’s own actions, and it’s his role as teacher that provides the best example of what a Catholic teacher should be. Those around him called him “Rabbi,” “teacher,” and if one is to enter into the business of “labeling” Christ, for example, as philosopher or moralist or social activist, one must first apply the moniker of teacher to the Son of God. 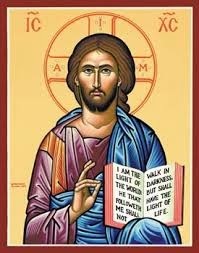 Christ is a teacher, however, who wrote no rule of law, code of conduct, or guidelines for living. In fact, he wrote nothing at all. Instead he was present with people, spoke with them, laughed and wept with them, excoriated them, healed them. His teachings emerged from the stories he told, and those stories primarily concerned people interacting with one another: rich men and beggars, landowners and hired men, the socially respected and outcasts. Those who followed him were drawn by his whole person, word and action. Apostles like Simon, Andrew, James, John, and Matthew began to follow Jesus not after hearing about what he taught, but after encountering him in person, face-to-face, when he called each specifically. People thronged in masses and reached for his garments in hopes that they would be healed. If I’m not breaking the second commandment if I claim that Christ had a pedagogy (vulgar word that it is), I would say that his was a pedagogy of presence. We might wonder what it would have been like if Christ had arrived in a different era. What would happen if he were among us now, teaching, spreading the Gospel? He could reach so many more people with modern technology, we might say. Instead of only a few thousand hearing his words, he could touch billions of lives in an instant. Wouldn’t that be so much more effective? If only Christ had had access to Twitter! That question misses the point, really. Such a figure would not be Christ, would not even be Christian in the strict sense of the term. For Christ’s method of teaching—through personal encounter—gives birth to Christian theology and the sacraments. For Christ the most important thing was not passing down information or set of rules but turning others toward him first by being present with them. Another famous teacher, even older than Christ (and often compared to him) had a similar method. Socrates, like Jesus, wrote nothing. His method was not even to preach, for he had no set of principles to pass down. Instead he met people, conversed with them, and questioned them so that they might examine themselves and seek wisdom. It is Socrates’ life of conversations, ending in his death, and recorded primarily by Plato, which constitutes his teaching, so influential in the development of Western thought. What does all of this discussion of Christ and sacramental presence mean for the Catholic classroom? For one, it demands that we prioritize real human-to-human interaction in our classes. Catholic education is not the acquisition of knowledge but the act of one human being helping others pursue wisdom. The role of the teacher is essential, as in many ways she is an alter Christus (“another Christ”) to her students, someone who leads not simply by disseminating information but by being the vessel through which her students come to desire what is real, whether it be in Chemistry or History or Literature. The model for human interaction is conversation, and our conversation should be the foundation of our classes. The technology we use, whatever it may be, must remain ancillary to our conversations with our students. Technology, in this sense, could be something as old-fashioned as an 8x11 wood-pulp handout or as recent as a touch-screen tablet. Teachers can kill a class by allowing either to get in the way of their presentation of the subject. Bad Power Point presentations are a great example of this, as everyone’s sat through a few, I’m sure. When used most effectively, a Power Point presentation contains the most essential information, and the presenter brings that information to life, gives it color, places it into context. But when a presenter simply reads through the slides, he becomes secondary to the information those slides contain, and in a sense he disappears, for a human person is no longer necessary for instruction. Why not just email the class the .ppt file and give everyone the period off? When conversation doesn’t reside at the core of our teaching, we have lost our sacramental ambitions, and failed as Catholic educators. At its root, conversation indicates a “turning” (vers) of one person to another, and in that regard is different than discussion, which connotes something more benign, people talking about a common idea. Conversation requires human beings to encounter one another as persons, and suggests a certain vulnerability or openness to what may pass between the individuals who have turned together. What is the role of a Catholic educator in the midst of the flurry of screens and devices that bring the modern world to our fingertips? It is to keep the human person at the center of our teaching. The world of information may be at our students’ fingertips, but we should know better than to think it’s the most important one. That honor goes to the world comprised of flesh and spirit, of encounter and conversation. That’s the reality that must guide how we run our classrooms, and from which all else follows. Although the world has changed, the underlying problems are more as less the same as yesterday. Since technology increases the ability for people to interact, classrooms can teach students how to communicate in a respectful and insightful way and obliquely guide students to more responsible uses of their devices. Thanks for being a progressive voice for teaching the youth using all available resources.